Consciousness and healing at your fingertips. The Spirit of Reiki is a practical, hands-on guide to the ancient healing art of Reiki. 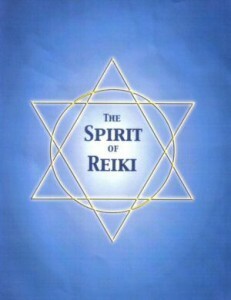 This book includes the symbols of Reiki and the how to of Reiki treatments. Teaches everything from beginner to the most advance. Click here for additional instruction. Do you want to experience the deepest and most powerful love, but don’t know how? Have you heard that peace lies within, but don’t know where? Are you tired of having too many questions and too few answers? Is it your deepest longing to come home? Reiki is a healing art and one of the most common throughout the world. It is simple to learn and powerful in application. It is used as a means of complimentary medicine in the treatment of serious diseases, such as Heart Attack, MS, Parkinson’s Disease, Cancer etc. It is also commonly used by parents and caregivers to keep families, friends and relatives in the best of health. Our bodies have the ability to heal. We see this as our bones knit together, scabs form over wounds, and sprains and strains on muscles heal. Reiki optimizes your own healing ability. It puts you more in touch with innate abilities, which you already have. There have been many discussions as to what Reiki is. I have heard it said that it is a Japanese teaching with origins in the Buddhist Sutras. I have heard it said that it is a healing method, a means to enlightenment, a relaxation technique, and so on. It is to each of us, however much we have experienced from it. if we really ask, if we really use Reiki, if we have the courage and the sincere desire to learn, it takes us to places unimaginable and to places which defy definition. It is self teaching and dependent only on the effort of each student. Use if for relaxation, healing, or consciousness. The choice is individual and completely self regulatory.